There are many threads in this nocturnal miracle. Let’s try to disentangle its wonders. Oars in the silence of the night. It was the disciples’ boat. They were on their way back from Bethsaida to Capernaum. It had been a heavy day: the miracle of the loaves and fishes had happened only a few hours before. The men were still stupefied by that prodigy and by the joyful task of emptying the inexhaustible baskets. Then the Master had sent them away with the boat and gone up a mountain to pray. And in the boat they were weighed down by that vague fear that always assailed them when he wasn’t there, that longing for another sort of life that made them silent and seem almost strangers to each other. At such times the fact of belonging to him didn’t count. A trembling leaf, not to mention a ghost, would make them jump to their feet, their hands in their hair. Yes, a figure was walking on the waves and the moon threw its long shadow over the lake. It was a figure without a face, just with those haunting steps directed - there could be no further doubt about it - towards the boat. ‘I’m coming to you’, the steps on the water were saying. A jump. Someone had climbed over the side of the boat and thrown himself into the water. Now two people were upright on the waves walking towards each other. It was Peter who had leaped overboard. He was the only one to leave the companionship of his safe corner and throw himself onto the black waves of unknown depth. Why? We know why - because he loved Jesus more than the others did. But Peter also felt a personal temptation of professional curiosity. What a revenge for a fisherman to be able to walk on the water, the treacherous water . . . And Peter gave way to the intoxication of that challenge which for an instant made him like the other, held him up in the same magic way. Perhaps the kingdom of heaven consisted in walking on the water with one’s feet dry and one’s body as light as a seagull’s. What had happened? Why at a certain moment did he begin to sink and throw the miracle out of gear? Faith is an impalpable flash. Who can mark the frontier between faith and doubt? 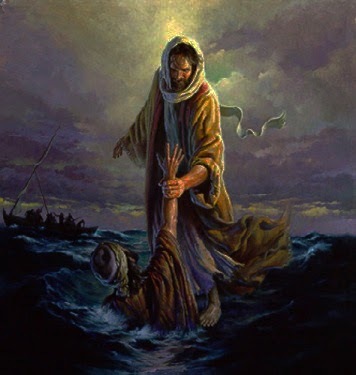 Even Peter was unaware of the imperceptible thought which made his heart beat faster and made him murmur: ‘Will I make it?’ But it was enough and the waters opened. Then the other one grasped his hand and set him afloat again.